Trust in Him to finish the work He started in you. 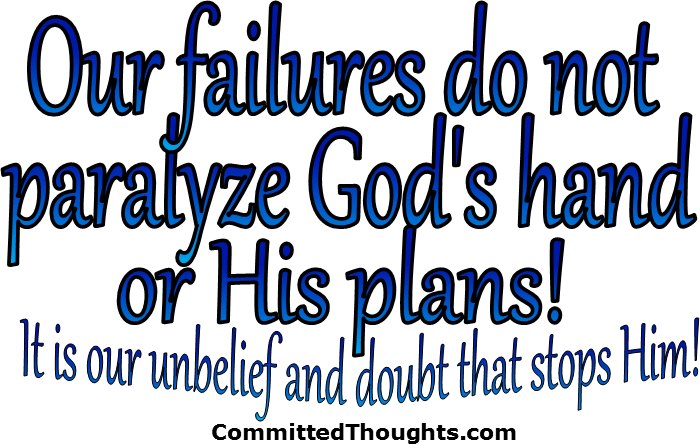 Our failures do not paralyze His hand or His plans. 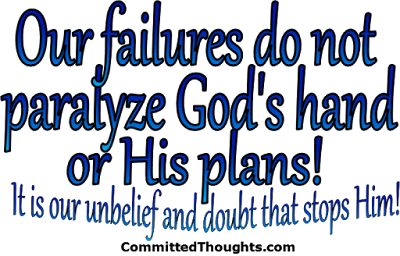 He can work good out of our failures, it is our unbelief and doubt that stops Him. He is the great “I am.” He has all of our days planned out and those plans are written down! He is simply waiting for us to seek Him first. Learn His name and His nature. Look for Him in all you do, and you’ll see just how entwined He is with your life. Trust Him. Amen; its just that trust thing can be so hard sometimes. So true! And it should be the easiest thing!! When I saw your title: "Failures Don't Faze Him," in light of his recent speech, I thought you were going to write about Pres. Obama. Snicker. I know... Sorry. But it's pretty funny. The actual post was much better and more helpful! And I'm glad t's true. haha His post is coming. It's just so bad, I wouldn't know where to start! So. I managed to get my blog up and put a Christmas message on it. (I'd email you, but I seem to have lost the email you're using now.) I don't plan on blogging in earnest until January, but just wanted to let you know I'm back.